News now from Bill Thiem at Fraser Yachts that he's listed the 30.5m motor yacht Jubel for sale. A semi-displacement yacht built in composite by the Astondoa yard in 2003, her interior has satin finished wood panelling throughout with accents and headlining in Alcantara. Flexible accommodation is for 10 guests in five staterooms. Amidships are two identical double cabins with a connecting door which opens to create a vast master suite. A VIP stateroom lies forward and there are two twin cabins - all en suite. The main saloon has teak flooring, large windows and is open plan with a dining area for 10 guests. Deck areas are generous and the large aft deck offers al fresco dining and an electric sun blind for shade while the flybridge has generous seating areas, a wet bar and a fridge. 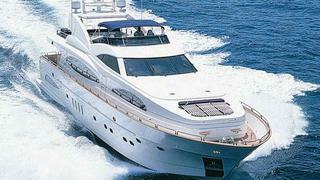 Twin 1,870hp MTU engines give her a cruising speed of 24 knots and maximum speed of 28 knots. Lying in Alicante, Spain, Jubel is asking €2.2 million, VAT paid.